Yeah this sounds a bit odd, but watch below for a video of Sky Sports pundits Jamie Carragher and Gary Neville spanking each other and giggling for about a minute and a half. 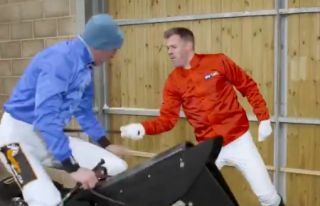 The pair took on a challenge in this promotional video ahead of the Cheltenham Festival, in which they attempt to stay on a mechanical horse and test their jockey skills.
? Stop what you're doing right now. However, they don’t exactly take the challenge too seriously and keep enjoying opportunities to whip each other and their instructor! As they so often are when they’re on punditry duty, these two are great fun to watch together.